It's Halloween, and your body nearly goes into a sugar shock out of sheer anticipation. Whether your vice is candy corn, gummy worms, chocolate, or everything and anything, we're here to offer a few alternatives. These recipes aren't for candy, per se (I mean what really defines candy?? 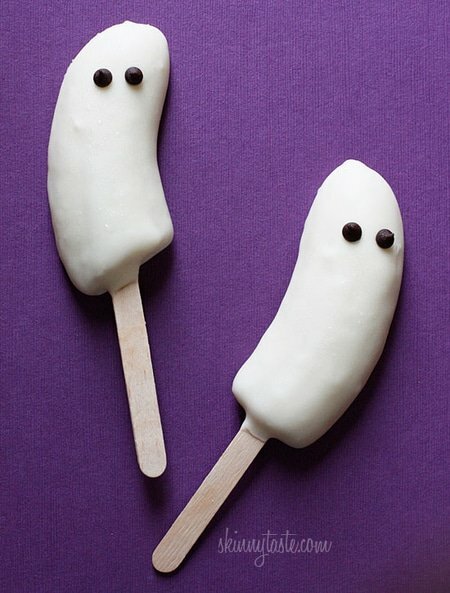 ), but they're yummy enough to share with your friends and festive enough to earn an invitation to a Halloween party. And, they're healthier than anything in the candy aisle, guaranteed (unless your local grocery store is organized in a very strange way). We saw this recipe on skinnytaste.com; one commenter here mentioned that they used greek yogurt instead of white chocolate to make this extra healthy. A few have said that they found it hard to melt the chocolate, so one person added milk and another added oil to make the mixture more easy to melt and dip the bananas into. Cut bananas in half and stick them with popsicle sticks. Lay them on a parchment paper-lined baking sheet and put them in the freezer for a couple hours. Once the bananas are frozen, heat up the white chocolate in a mug in the microwave, or double boil it on your stove. If you use the microwave, heat the chocolate in 30 second increments and stir in between. Stop heating once the chocolate has melted. Dip bananas into the melted white chocolate, then quickly stick two chocolate chips on as eyes. Lay them back on the tray and put them in the freezer. Enjoy frozen. 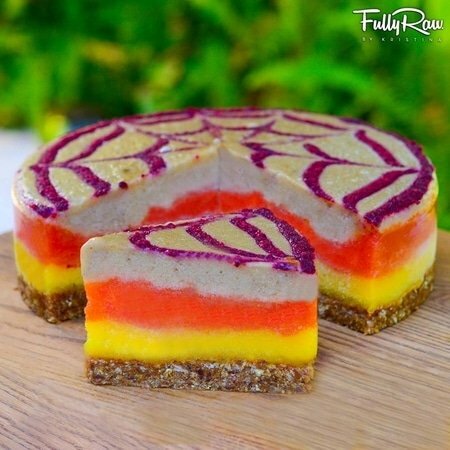 This recipe from fullyraw.com isn't one to whip up on the fly, but if you're willing to spend a few hours on something healthy, delicious, and very unique, this one's for you. Mangoes, papayas, and bananas provide the brilliant color here. Mulberries, dates, and cinnamon make a delicious crust. On the website, they call this dish a cheese cake. We're calling it “fruit cake,” because it just seems more accurate. Place mulberries, dates, and cinnamon in a food processor and pulse until its coarsely ground. Press the mixture into a pie tin. Blend mangoes in a high speed blender, then pour onto your crust. Put in the freezer to set (1-2 hours). Repeat above step with papayas. Repeat above step with bananas. Blend blackberries, then put the mixture into a ziplock bag. Once the banana layer has set, cut a small hole in a corner of the of the bag, and pipe the mixture onto the cake to make a spider web design. Keep the pie in the freezer until you're ready to serve. Okay, maybe sweet potato fries aren't on your list of classic Halloween treats, but sweet potatoes are (in the opinion of this writer) one of the healthiest and most delicious things out there. Plus, this recipe lets you bust out your cookie cutters (or practice your knife skills). This one is from tablespoon.com. Scrub the potatoes clean and slice them into 4″ rounds. Use mini cookie cutters to cut jack-o-lanterns, pumpkins, and starts into the middle of the rounds. Or, use a knife to create jack-o-lantern faces. Line a baking sheet with parchment paper, than assemble the sweet potatoes on it. 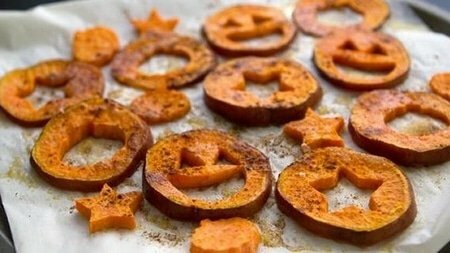 Drizzle potatoes with olive oil and maple syrup, then sprinkle with pumpkin pie spice and salt. Cook until tender, for 18-22 minutes.